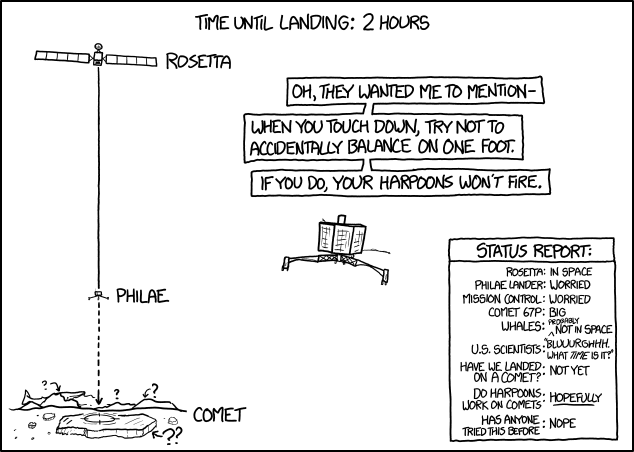 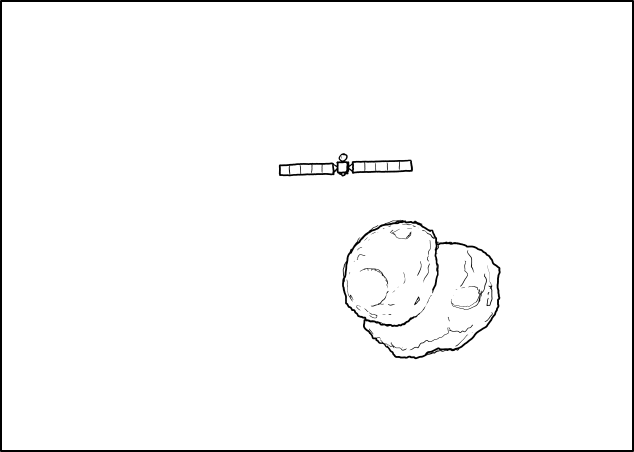 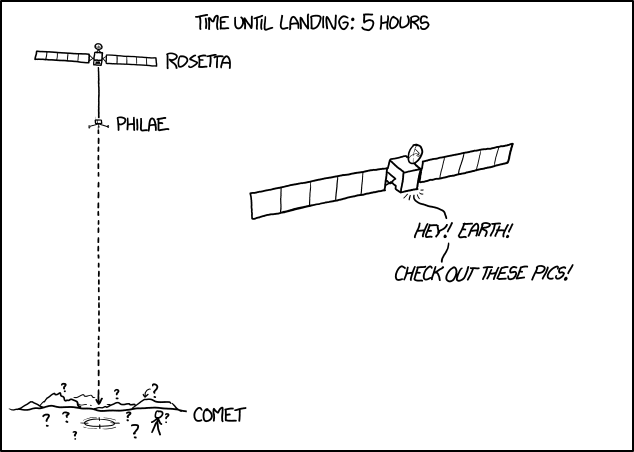 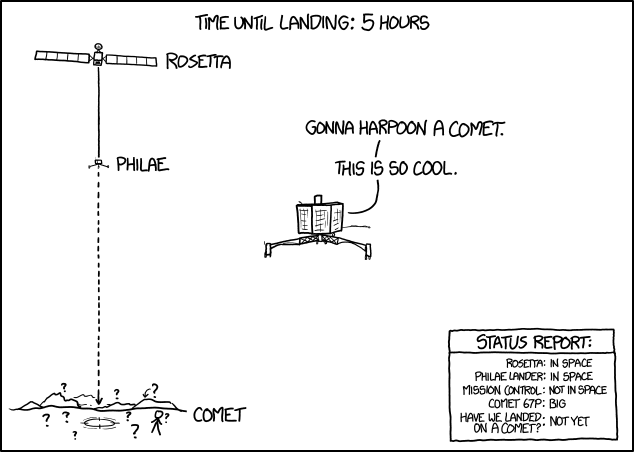 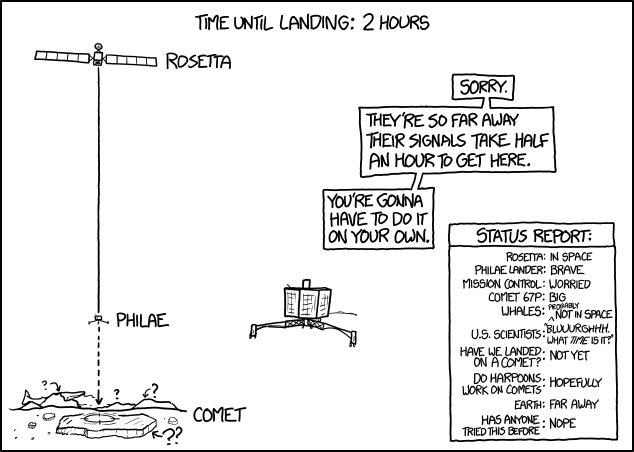 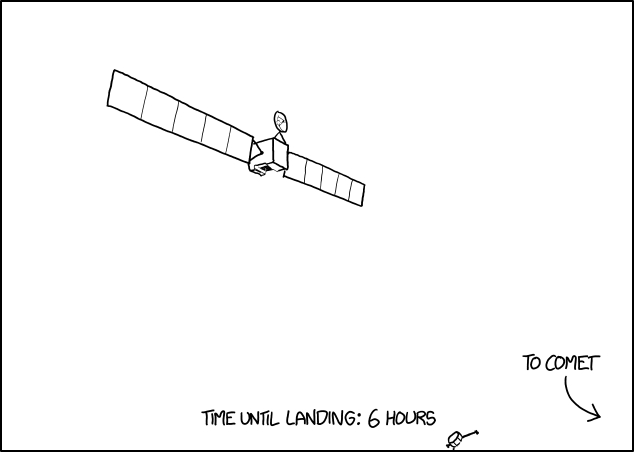 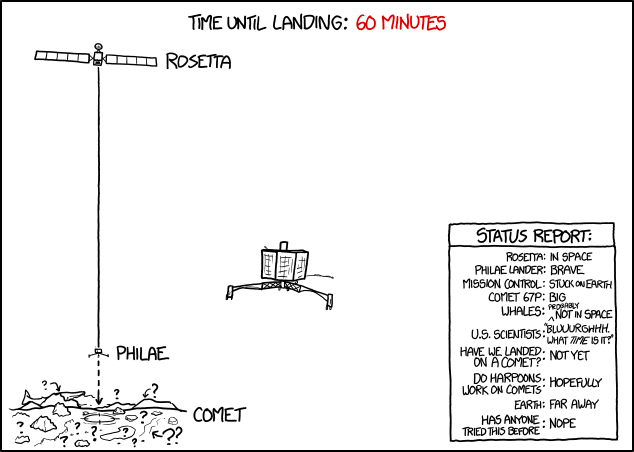 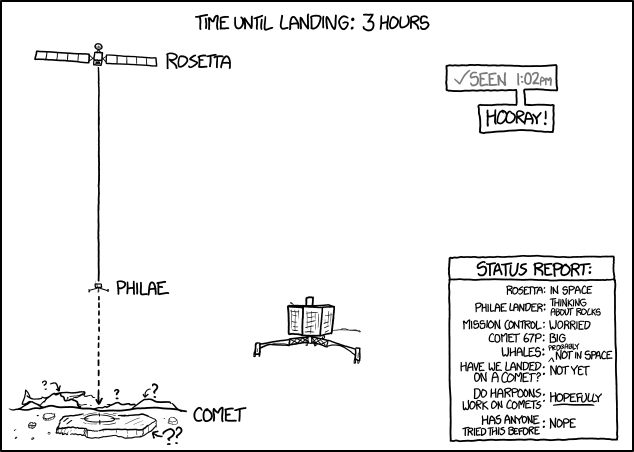 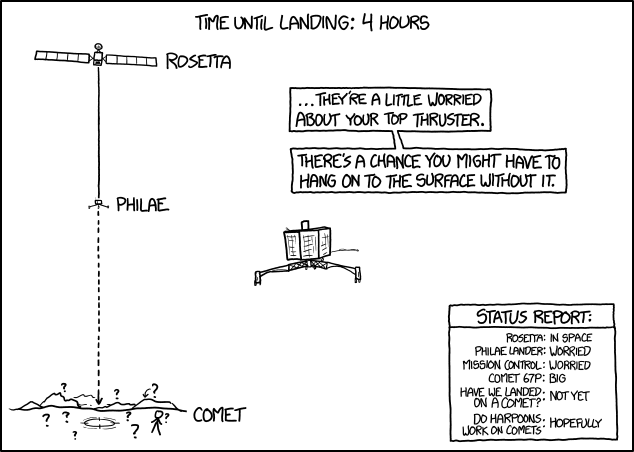 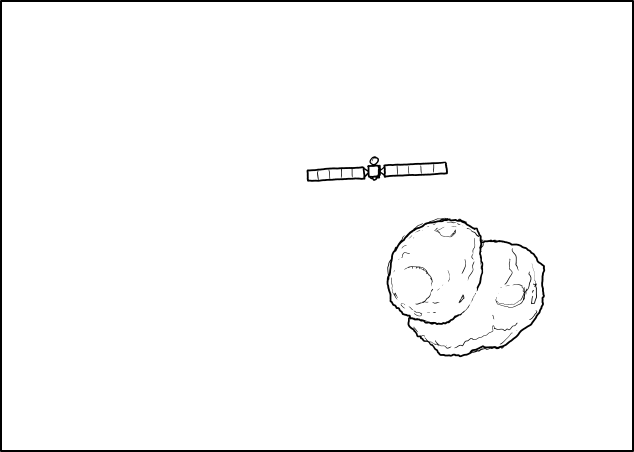 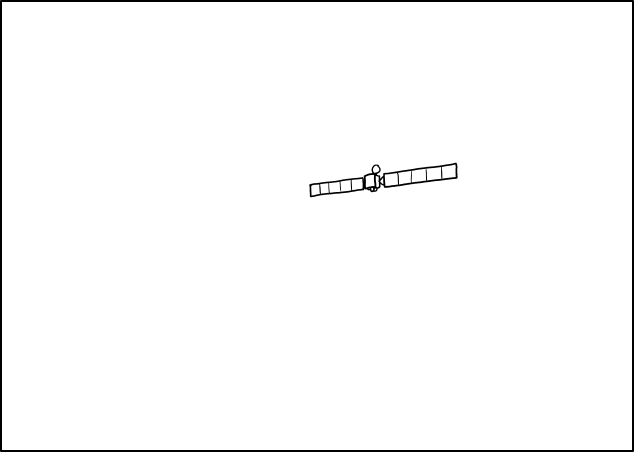 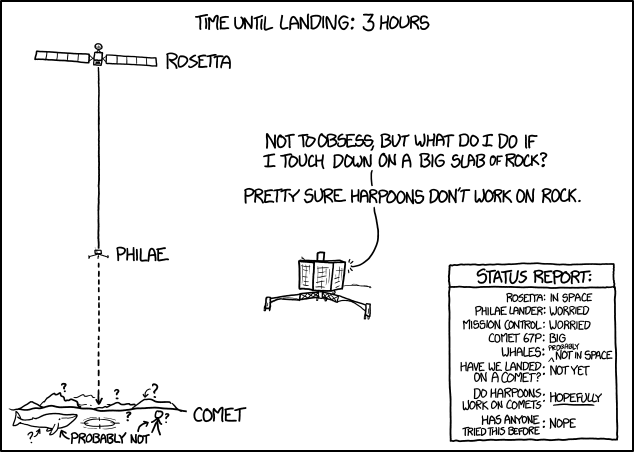 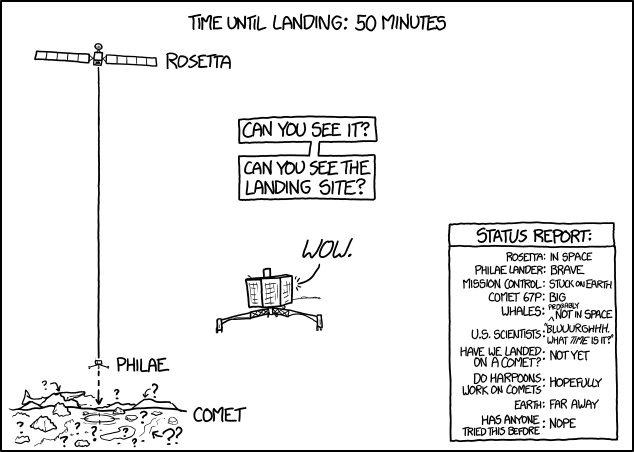 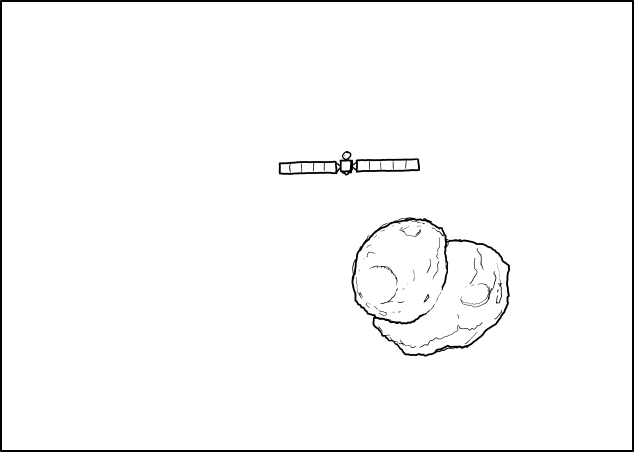 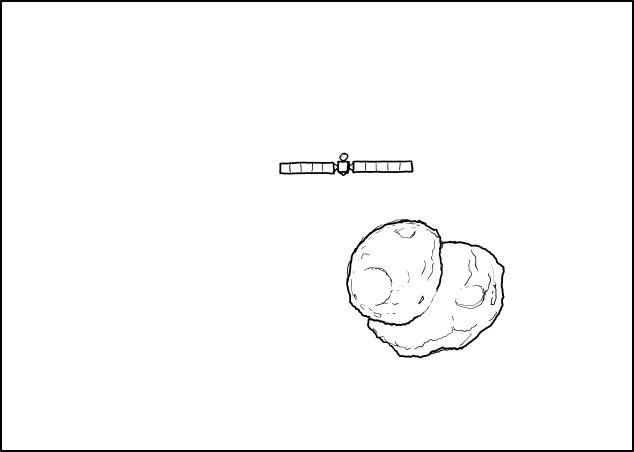 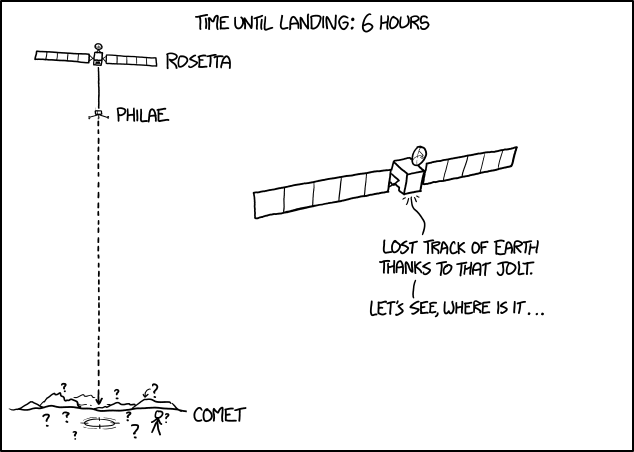 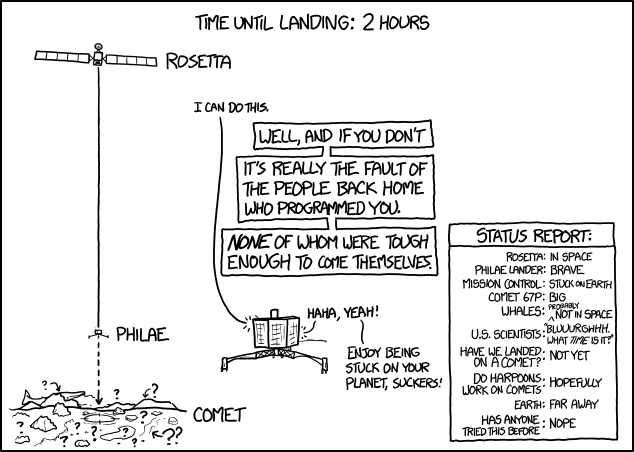 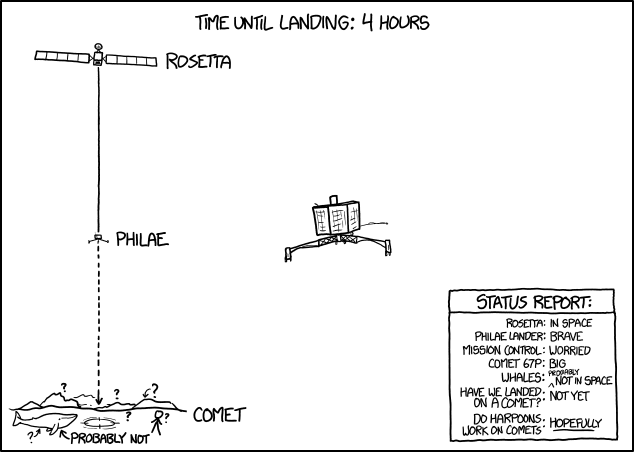 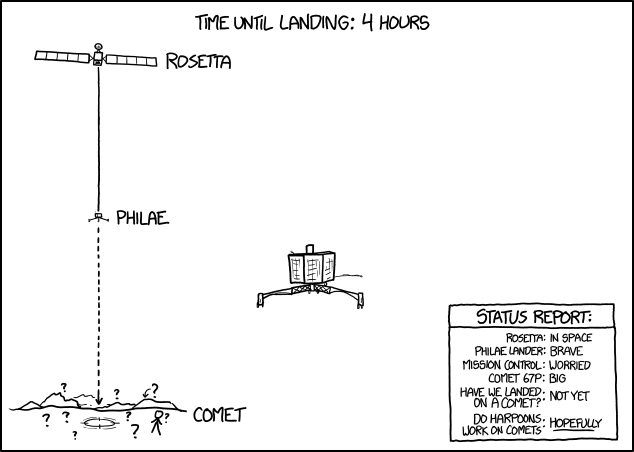 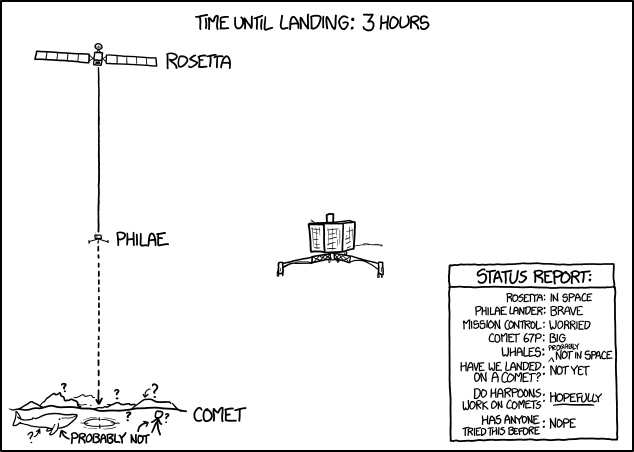 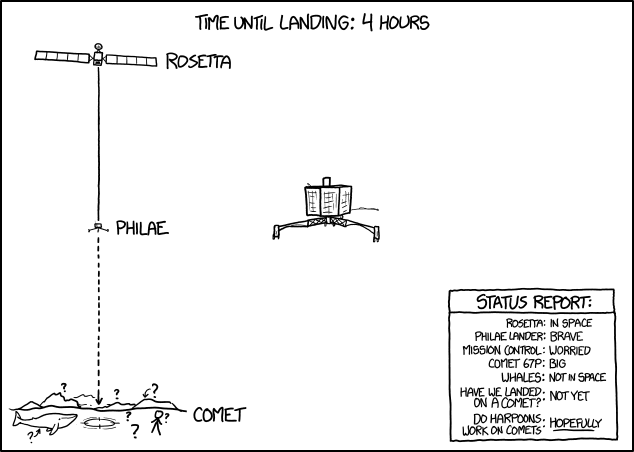 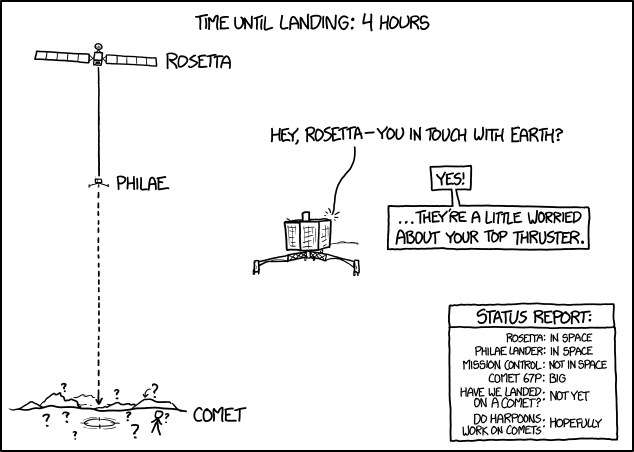 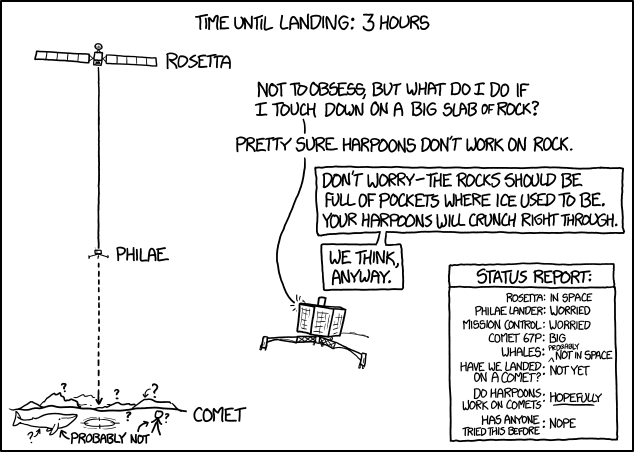 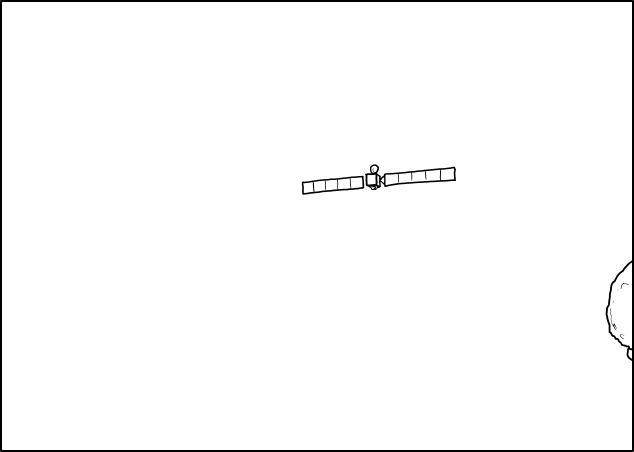 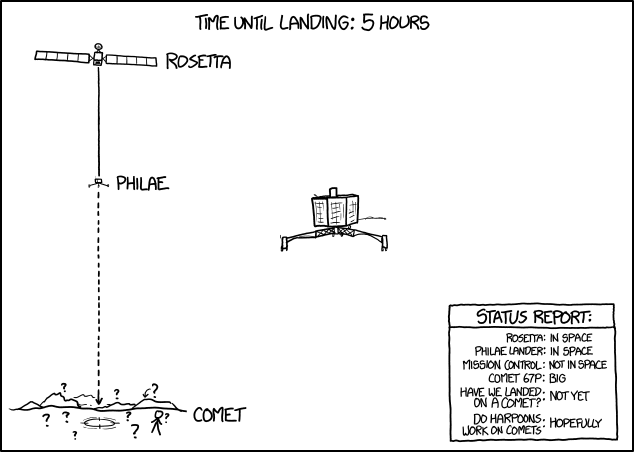 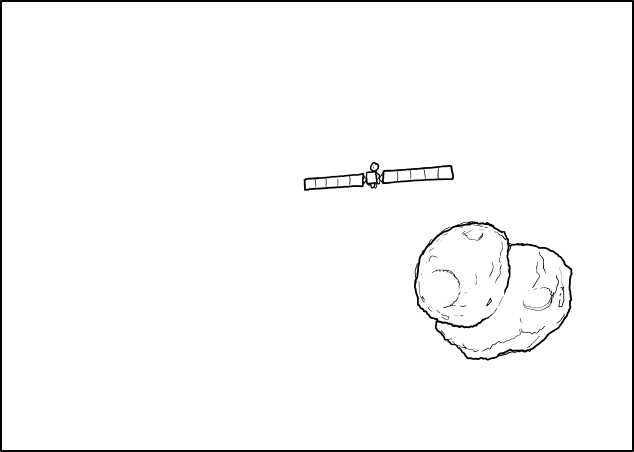 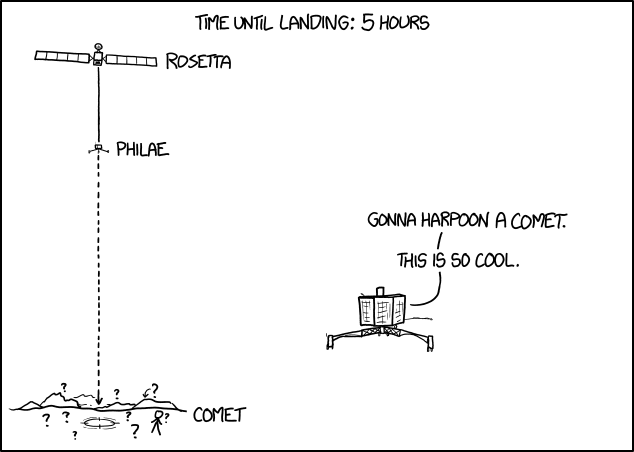 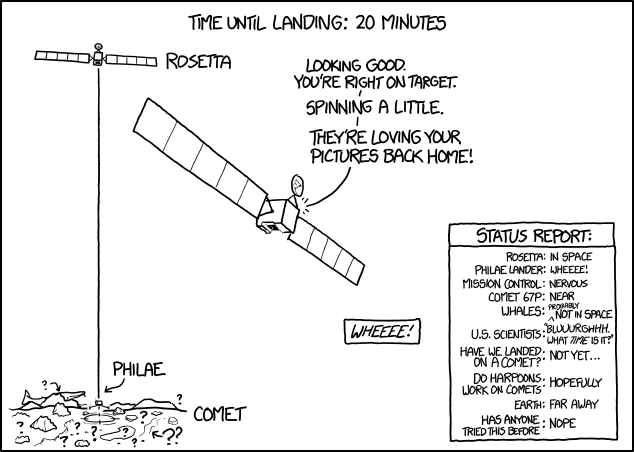 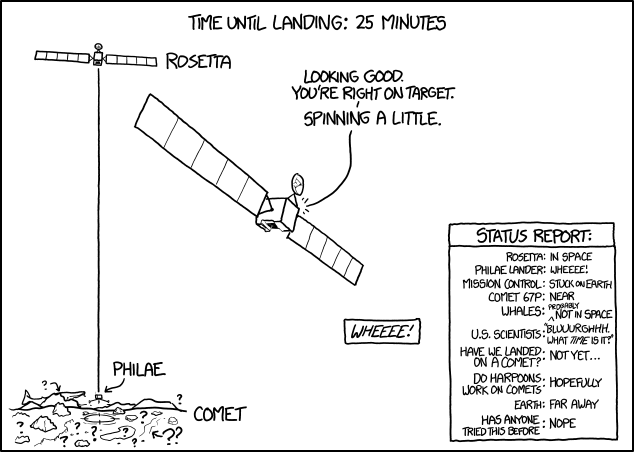 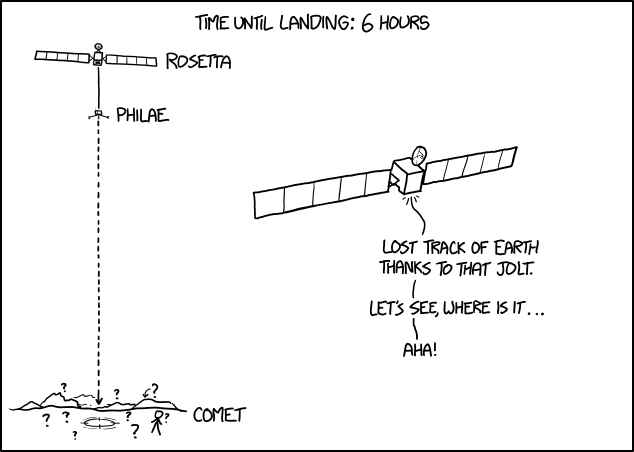 This comic changed over time during 12 hours and 15 minutes starting at 0:00 EST (when the comic normally is released) posting 143 pictures that tracked the progress of the Philae lander separating from the European Space Agency's Rosetta probe to land on comet 67P/Churyumov–Gerasimenko. 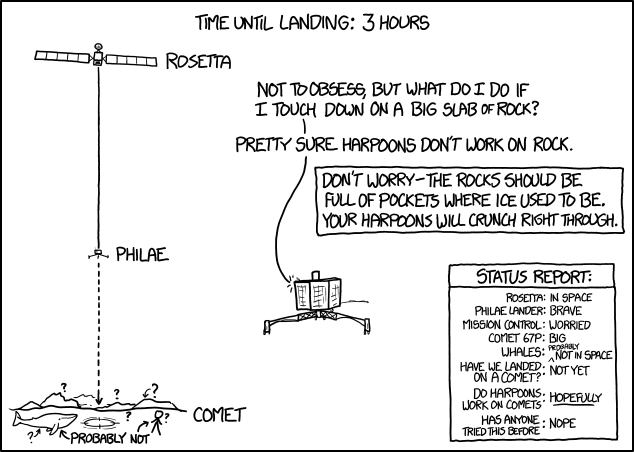 More info can be found here: rosetta.esa.int. 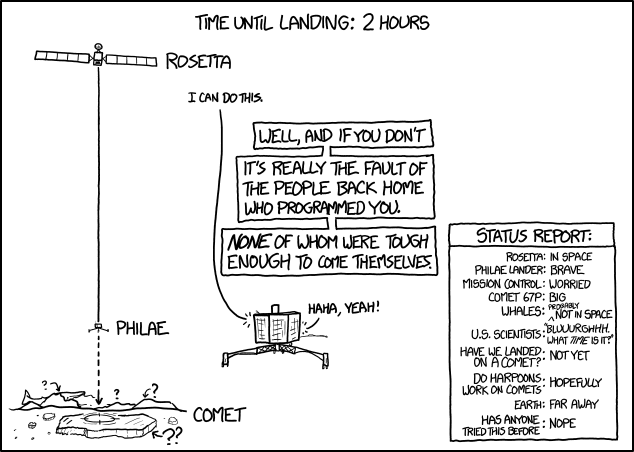 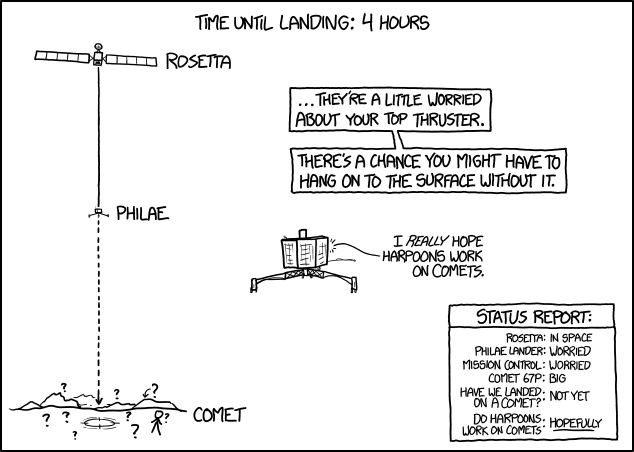 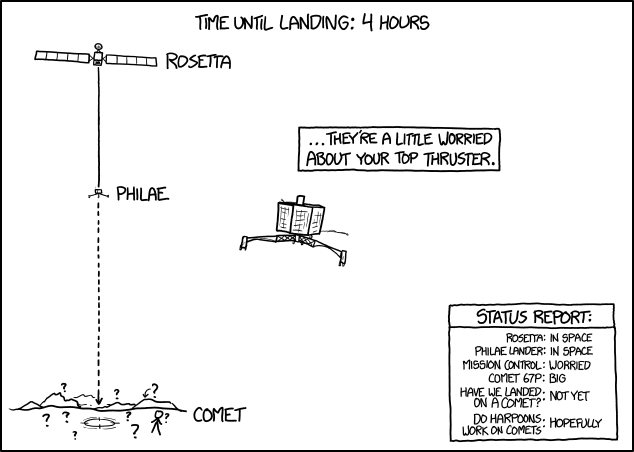 The comic presents the imagined anthropomorphic "thoughts" of the Rosetta spacecraft and the Philae lander (and occasionally other parties) during the hours approaching separation from each other, approach to the comet and finally the apparently successful landing on the comet. 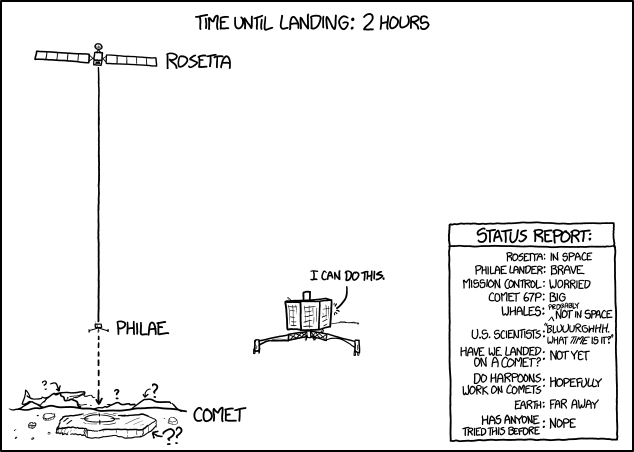 Beginning at 11:05, the comic includes a "Status Report" in the lower right corner which summarizes the status of various interested parties and accomplishments, beginning with "Rosetta", "Philae lander", "Mission Control", "Comet 67P", and "Have we landed on a comet?". 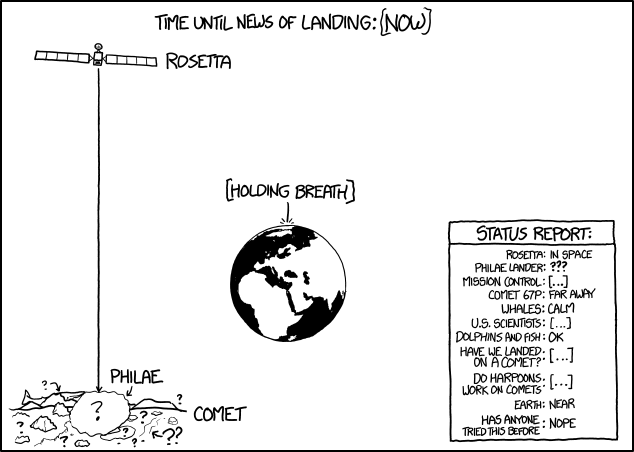 As events occur in the comic, more status summaries are added to keep track of the changes to the situation and the supposed emotions behind them. 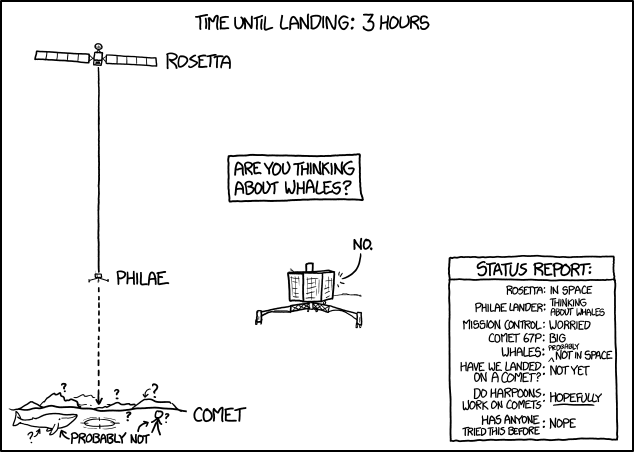 In many pictures a whale can be seen on the surface of the comet - often marked with a "?" 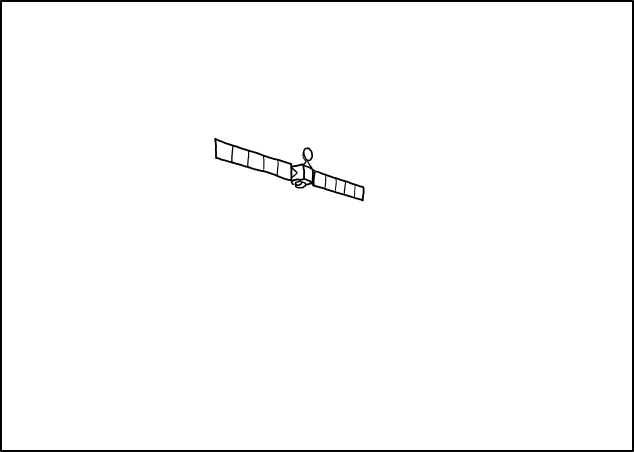 as are almost all other parts of the unknown surface at this time. 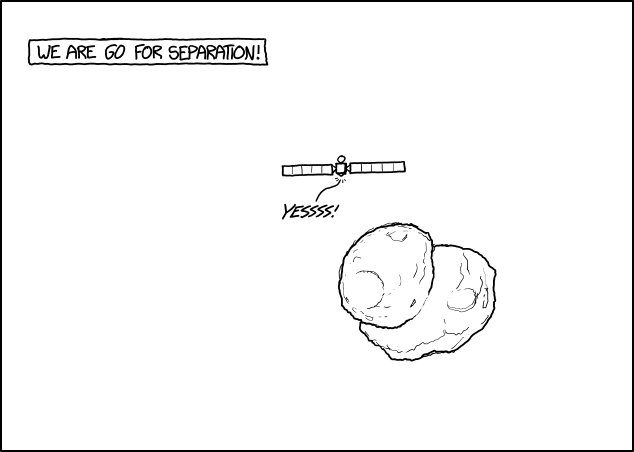 There is also drawn a Cueball on the surface also marked with a "?" Both are then at some point marked with a probably not - starting from 12:35. The whales are also mentioned in the "Status Report" where they for instance may be listed as "calm" or "(probably) not in space". 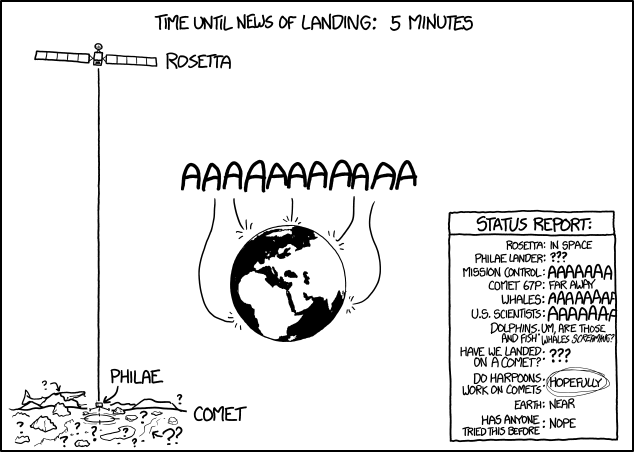 At 16:00 the when the entire Earth goes AAAAAAAAAAA the whales are listed as saying this as well (along with Mission control and U.S. scientists). 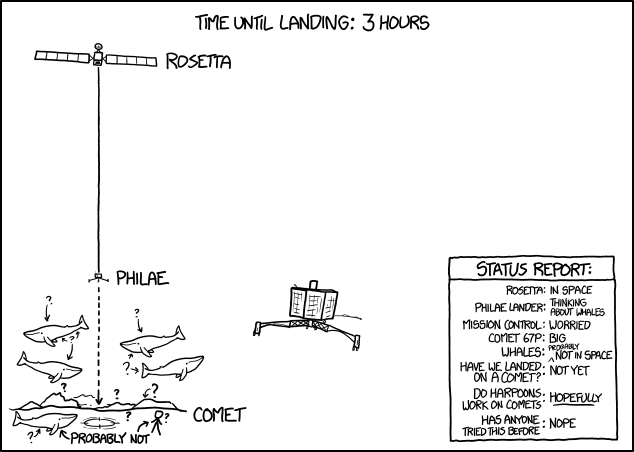 From this moment "Dolphins and fish" are also mentioned in the report. 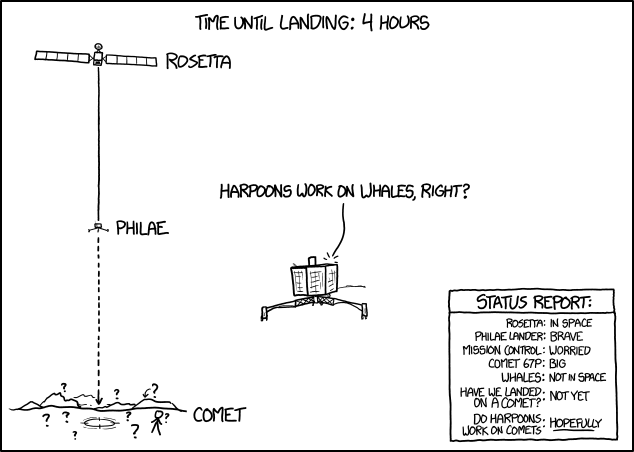 They are asking if it is the whales that scream. The reference to whales comes from the fact that Philae brought along two harpoons that should have been used to anchor it to the comet. 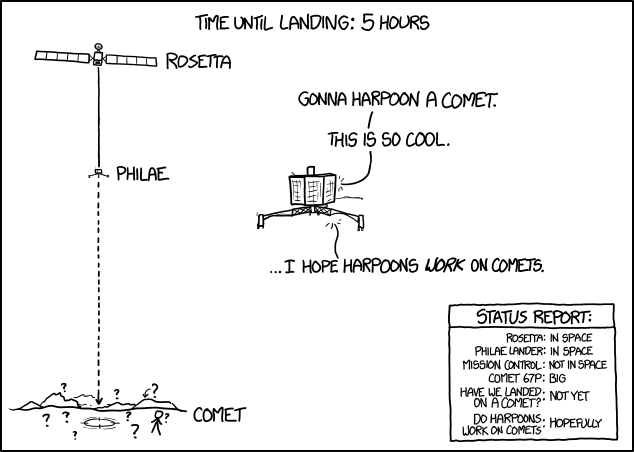 On Earth, harpoons have mainly been used to hunt whales; Randall previously brought up that comparison in 1402: Harpoons, suggesting that Philae was programmed to believe it was sent to kill the comet. 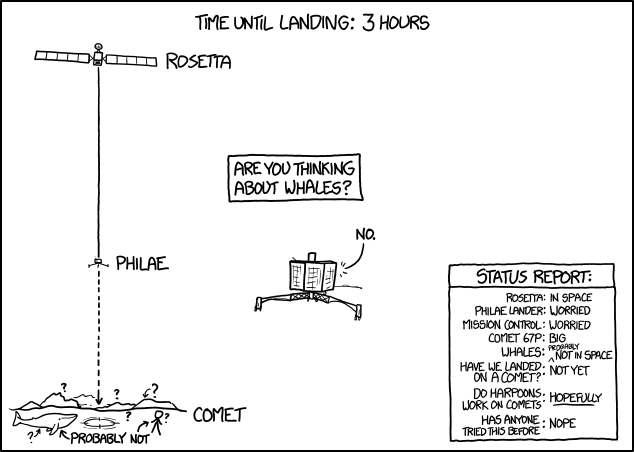 It is Philae that "dreams" about whales on the surface of the comet which can be seen in the picture for 13:25 and in the status report. 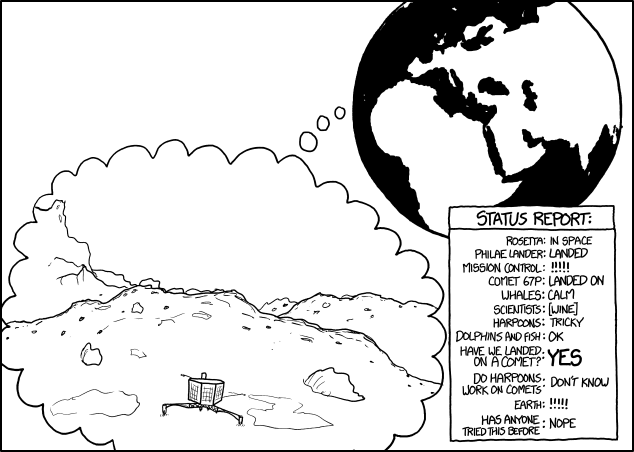 Some Douglas Adams fans believe these whales and dolphins are references to The Hitchhiker's Guide to the Galaxy and So Long, and Thanks for All the Fish. 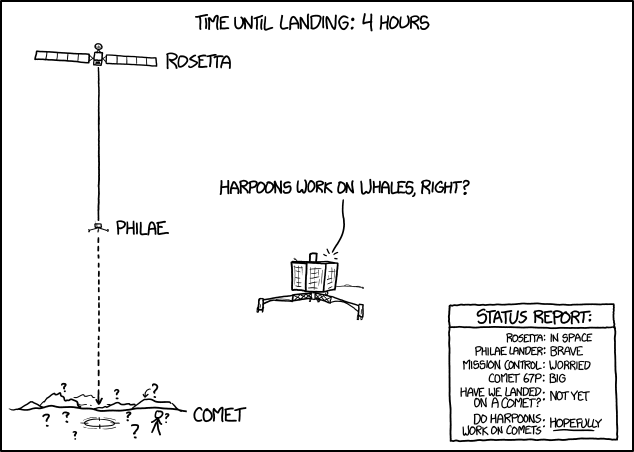 Whales in space have been appearing in fiction and art since the 1960s. 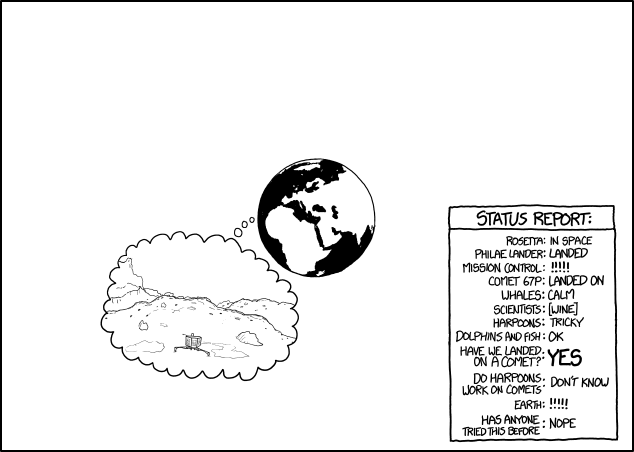 However, with the above-mentioned reasons for whales, dolphins and fish, this seems less and less likely. 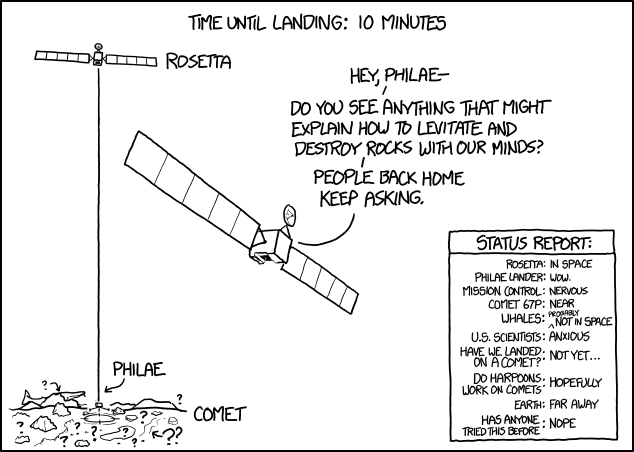 At 15:25 Rosetta asks Philea about destroying and levitating rocks via mind control. This is a reference to the Ambition short movie, ESA commitioned to gather public awareness of the Rosetta mission. 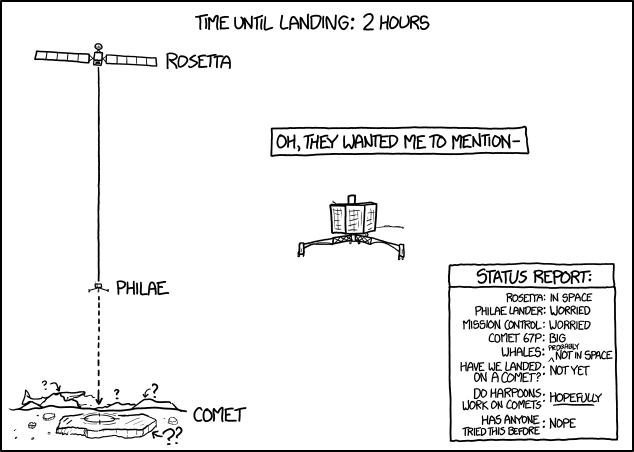 Shortly after release from Rosetta (10:15), Philae calls out 'Spaaaaaaaaaace'; this mimics the Portal 2 'Space core' who, on finally reaching space in the last scenes, gives the same elated cry. 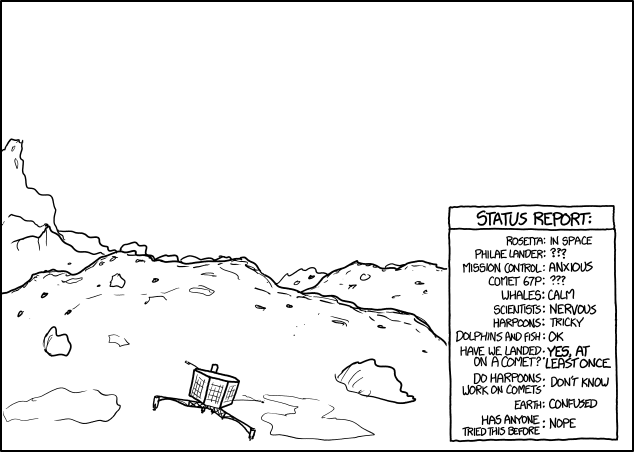 US Scientists presumably wake up at 7:40 EST (13:40 UTC) and in the report they now says "Bluuurghhh. 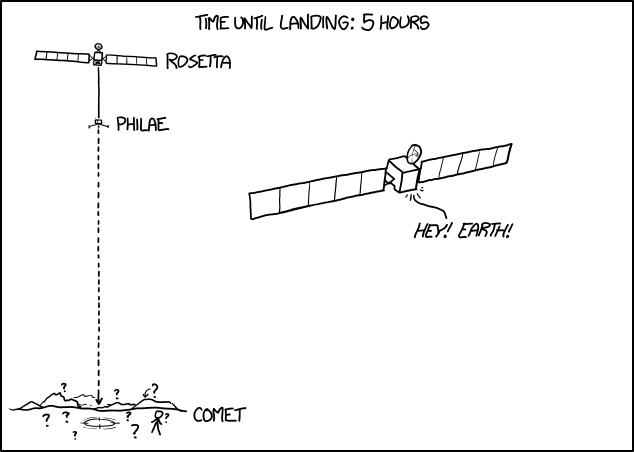 What time is it?" 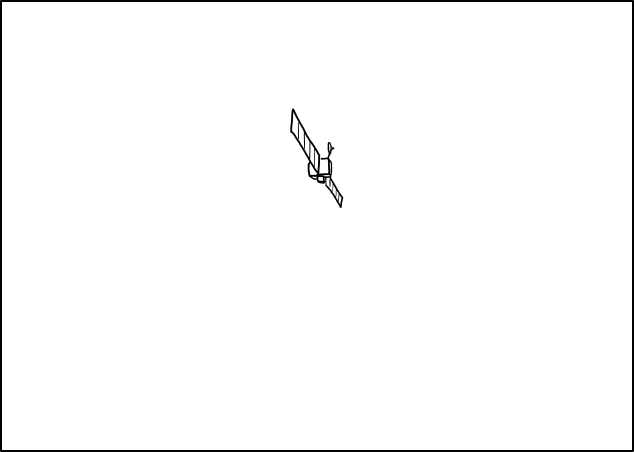 to indicate their tiredness. This does not change until 10:25 EST (15:25 UTC) so they are slow to wake (2 hours 45 minutes). 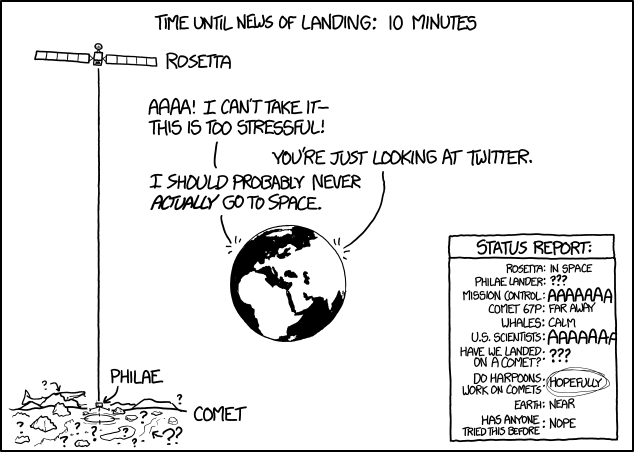 At this point, they becomes anxious as there are only 10 minutes to landing. 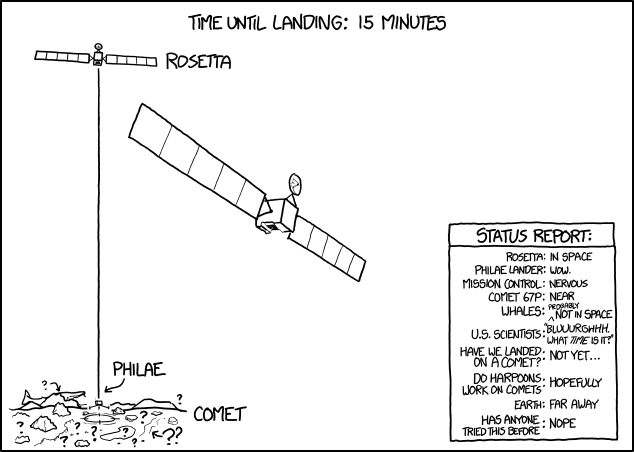 This last until there is 15 minutes until news of landing (a reference to the 28 minutes time delay due to the huge distance to the comet). From then on (15:50) they and the mission control (MC) say "AAAAAAA". 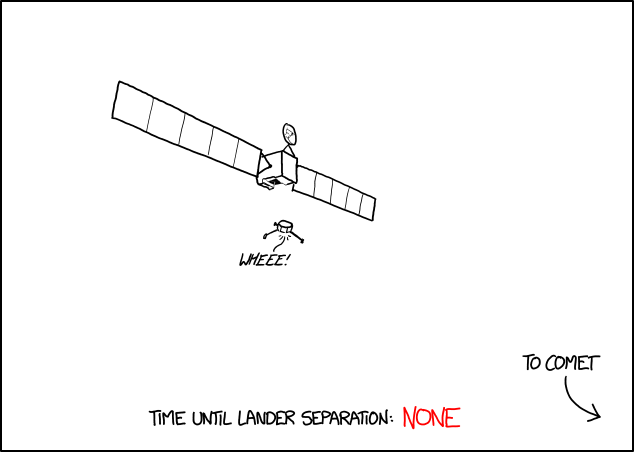 They stop this when the news should be there - the NOW (16:05) - and everybody holds their breath indicated by [...] - also MC. 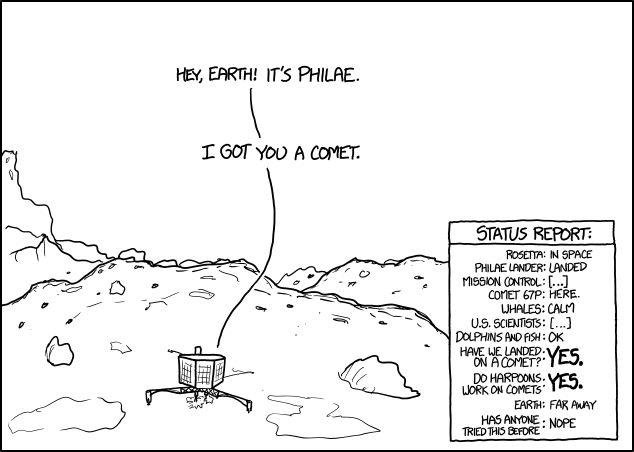 Finally (16:25) they and MC become proud (along with Earth) when Philae announces I got you a comet. 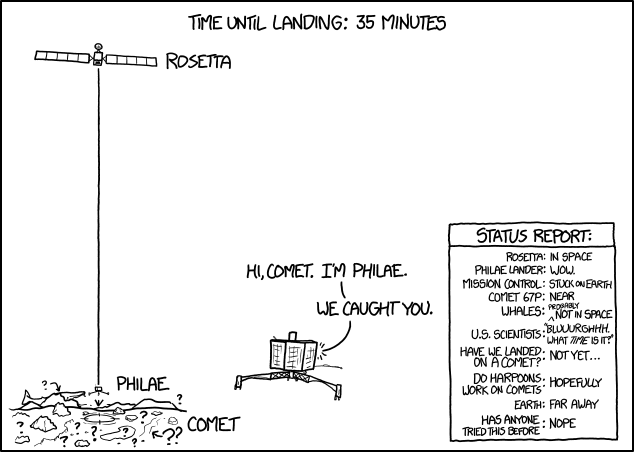 It should have stopped there but as Philae bounced around, they then becomes anxious again 16:40, and then this changes to nervous 16:45 (switching those emotions with MC). And then suddenly (16:50) it is no longer US Scientists but just plain Scientists - that are nervous. 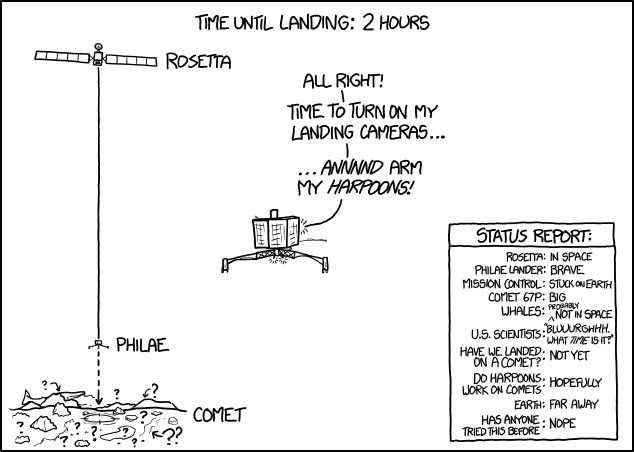 It stays like this during the last few pictures, although they again become anxious, but when Philae announces I did it, they drink wine as indicated with "[wine]" in the report from the second to last picture (17:10). 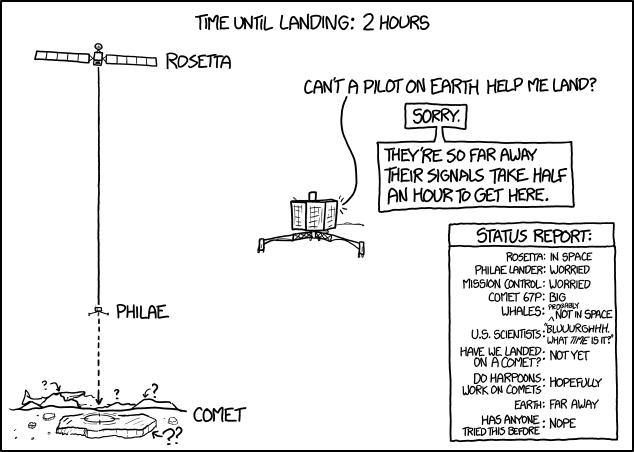 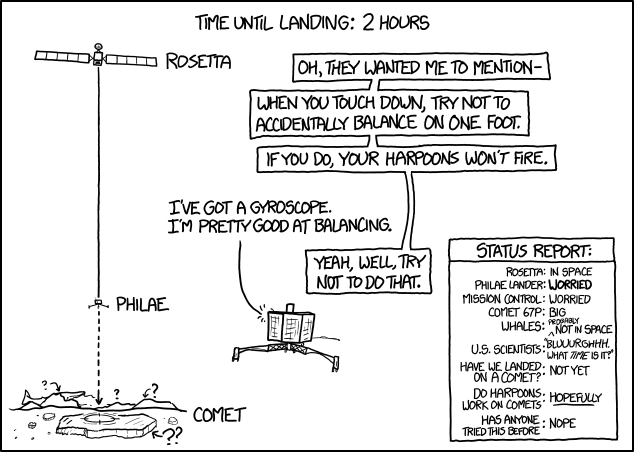 Randall has written "A big thank-you to Emily Lakdawalla for help and advice on this comic" in the xkcd page header for Landing, revealing the possible source of his near real-time data. 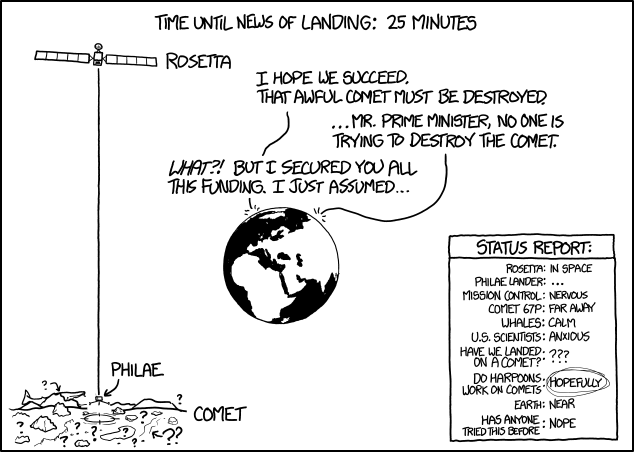 At 16:20 the status report had announced a big Yes to the questions "Have we landed on a comet" and "Do harpoons work on comets". 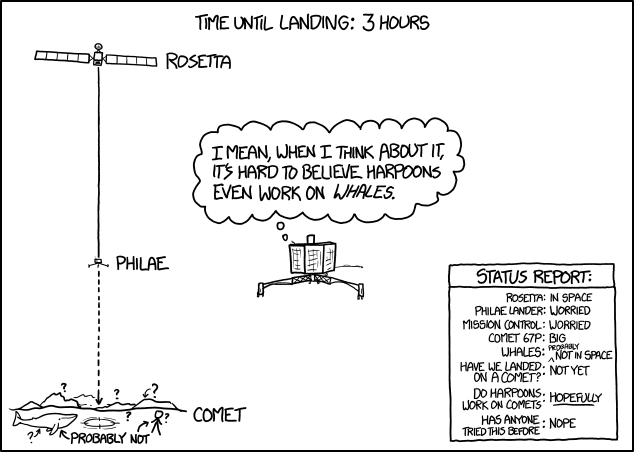 According to BBC News, the harpoons did, however, not fire as planned and the lander may have landed, bounced off, and landed again. 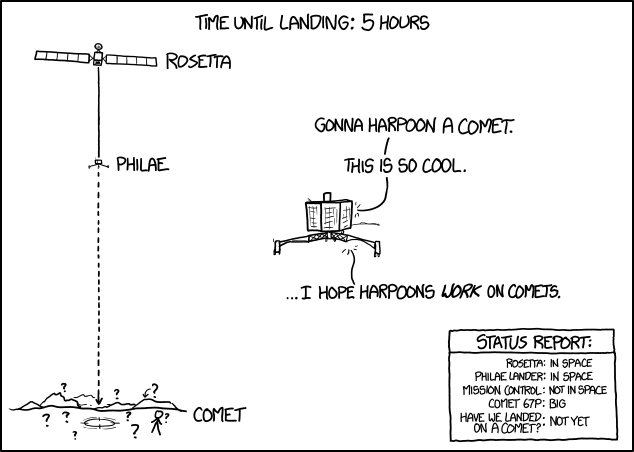 This would explain the change in "Do harpoons work on comets" to "Don't know" at 16:35 and the change in "Have we landed on a comet?" to "Yes, at least once" at 16:50. 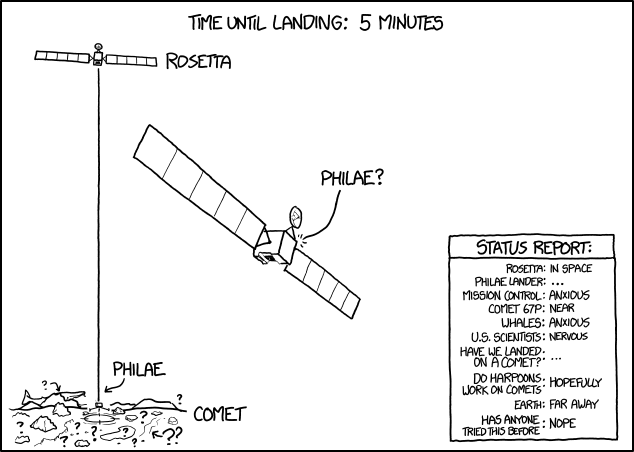 According to The New York Times, radio contact with Philae fluctuated, which would explain the "Anxious", "Nervous", and "Confused" statuses around that time. In the end the lander did land and whereas the Do harppons work status did not change, so did the have we landed on a comet which changed back to Yes at 17:10. 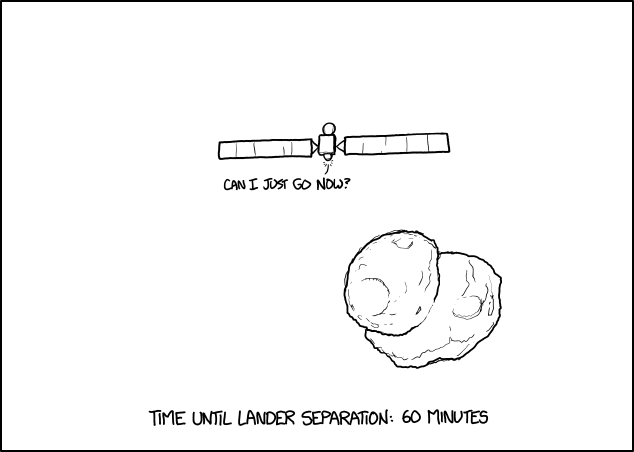 The lander bounced three times and ended up in a place where the solar panels where mainly in the shadow. 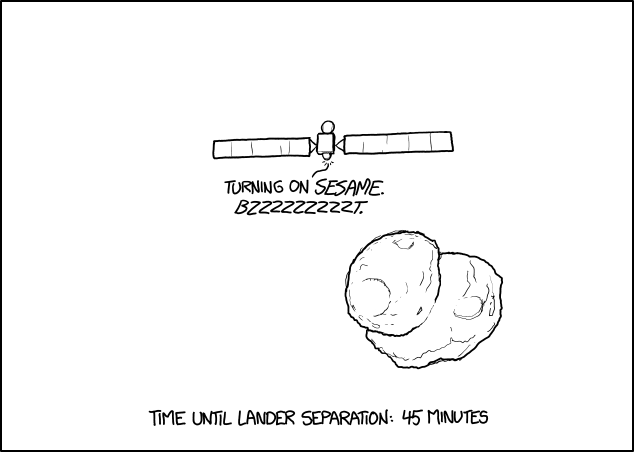 This resulted in the lander shutting down when its own battery ran out of power after only 2–3 days on the ground. 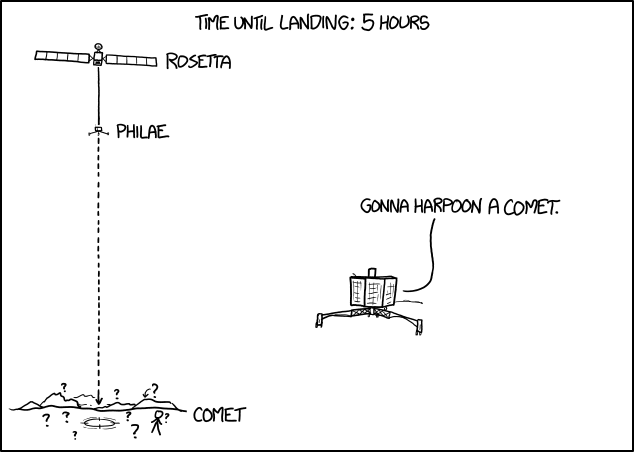 This seemed sad, as there was only a small chance that the seasons on the comet would change so that the panels would later receive sun again. 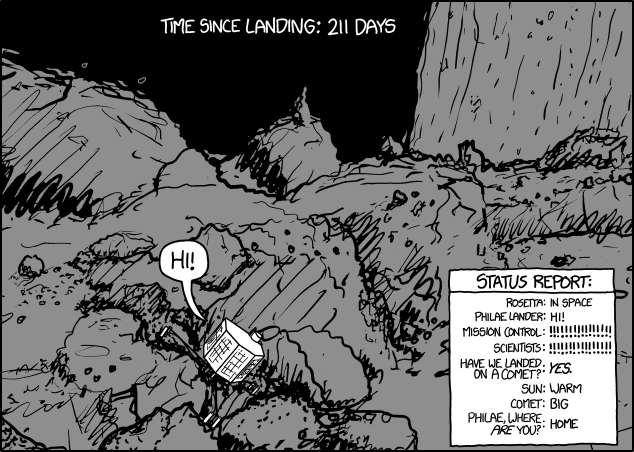 However, in the few hours that Philae had on the ground, it still managed to analyze the surface and obtain a lot of useful data - so that part of the mission was still a success already. 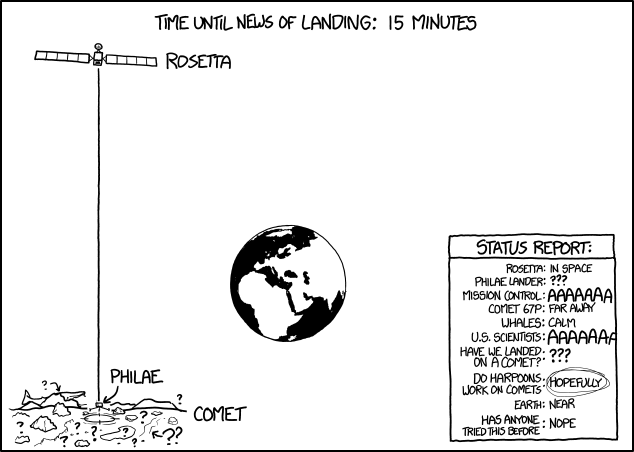 This all happened after the comic stopped updating. 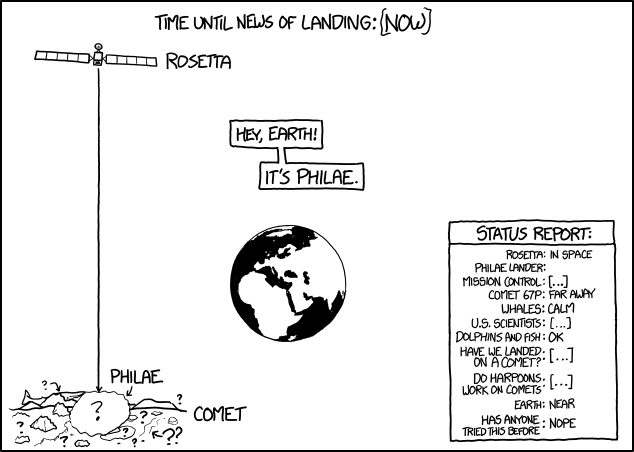 On June 13, 2015, it was announced that signals had been received on earth indicating that Philae had awoken and that the solar panels were functioning. 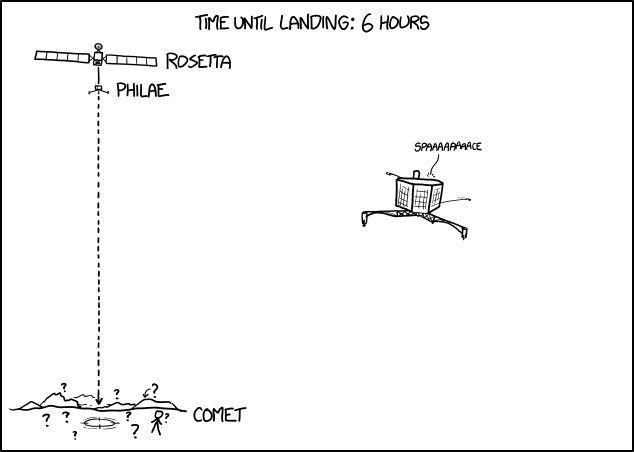 Ironically, had Philae landed in a place originally out of shadow, it would have already failed before this time (due to overheating), so it was actually fortunate that it landed as it did and would be able to operate during the time that the comet would be closer to the sun. 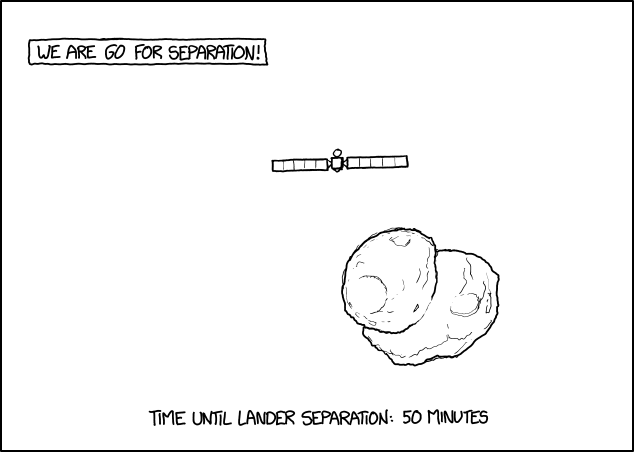 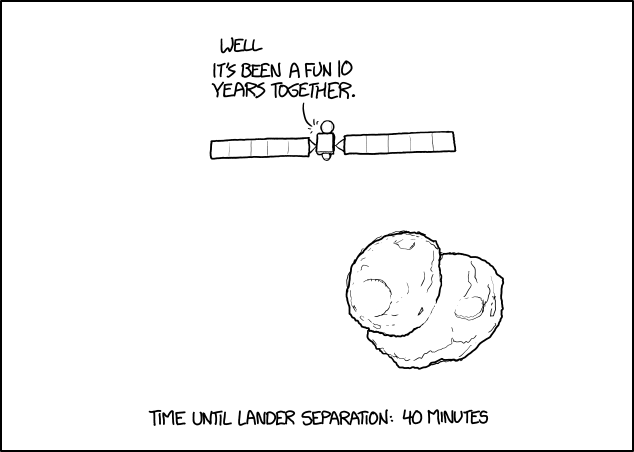 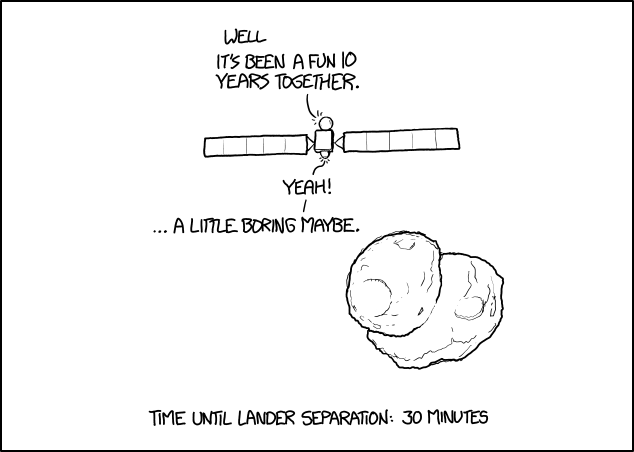 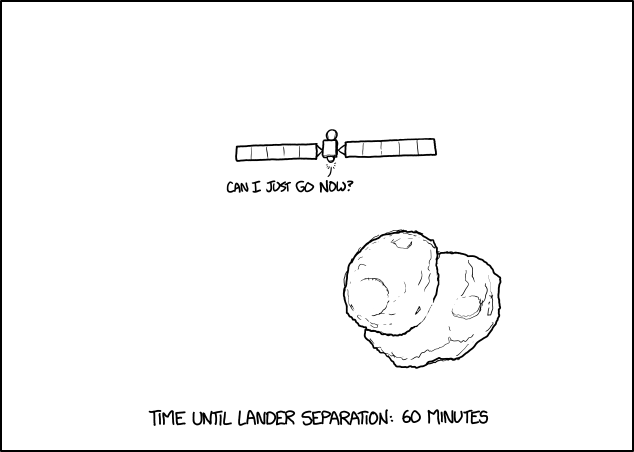 To celebrate the lander's revival, Randall updated the comic, depicting the lander saying "Hi." 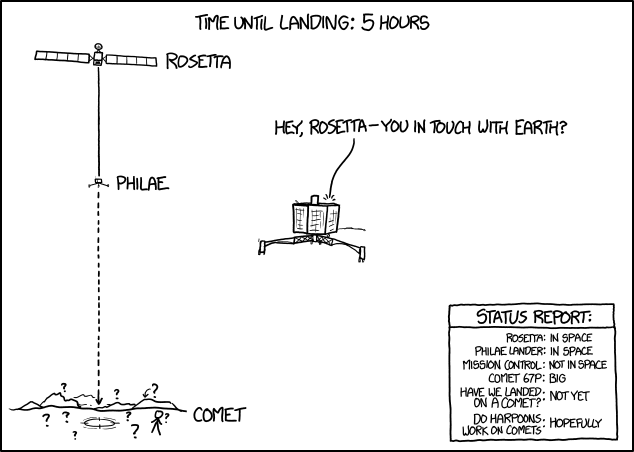 on the comet's surface. The comic title was originally "???" 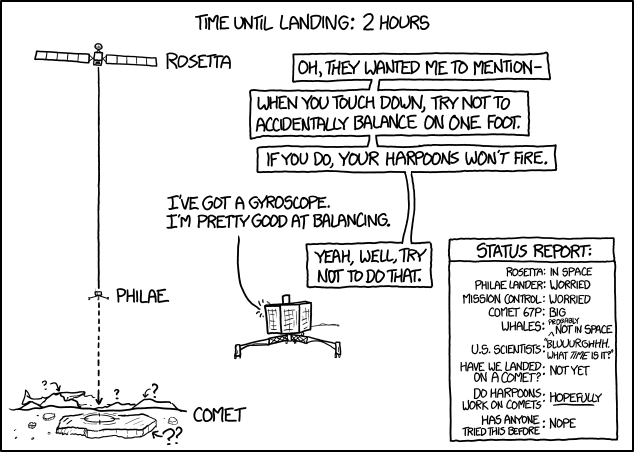 (probably to not give away too early what the comic was about), but changed to "Landing" when Randall came on live at five in the morning EST. 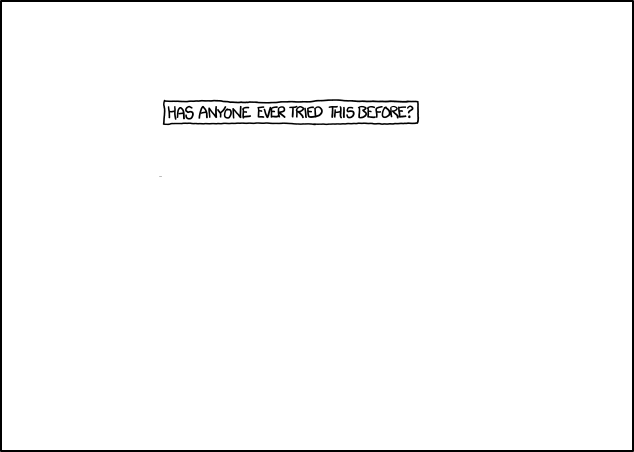 At that moment the title text also changed from "..." to "[LIVE]". It was also then that the timestamps' timezone switch. At 5:00 AM (EST) the time stamp in the picture naming scheme switched from EST to UTC as used in ESA's time keeping, resulting in a jump from 04:55 to 10:00 without actually any such delay between the two pictures. 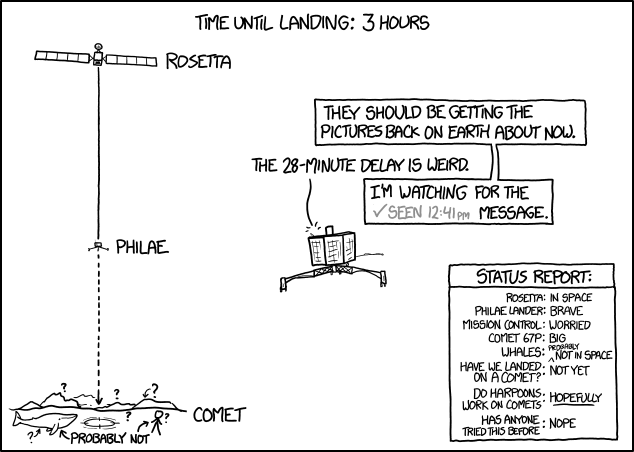 There were however a few pictures with more than 5 minutes of delay (about 11 times five minutes without an update in total during the "live" transmission). 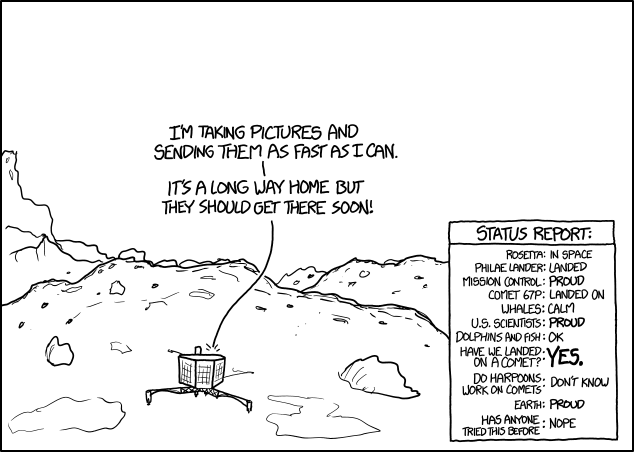 The update seemed to have stopped after 137 pictures at 17:15 UTC, 12 hours and 15 minutes after the first picture. 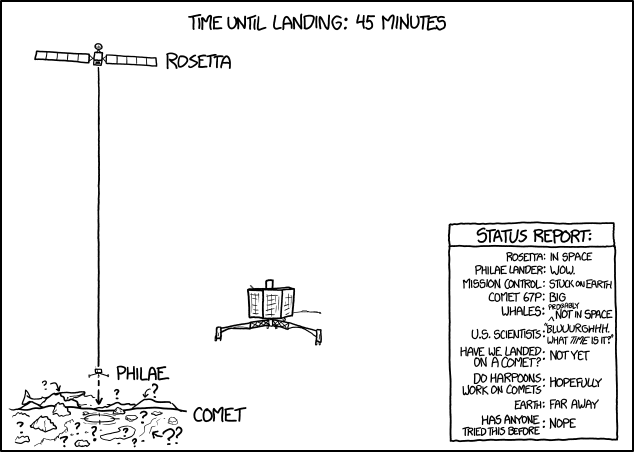 (The first picture has number 0, so the last had number 136). 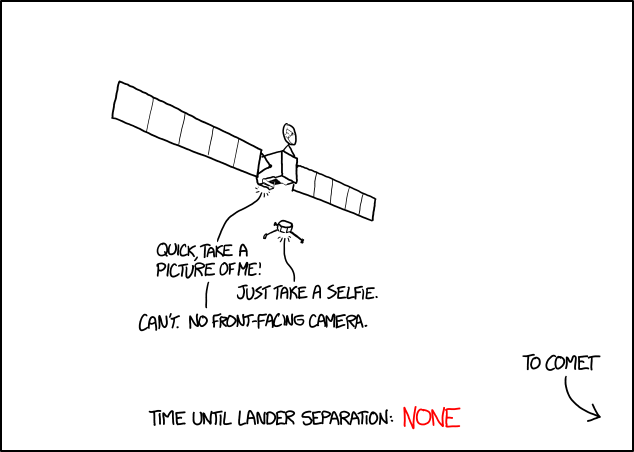 But later, sometime after 17:15 UTC, the counter for the last picture was increased to 142 (143 pictures in total), so maybe Randall inserted 6 extra pictures later - however he must then have changed the numbers on the pictures, since the last picture remained the same until mid-June, but with number 142 instead of 136. It is thus now difficult to find out which pictures would have been added later. 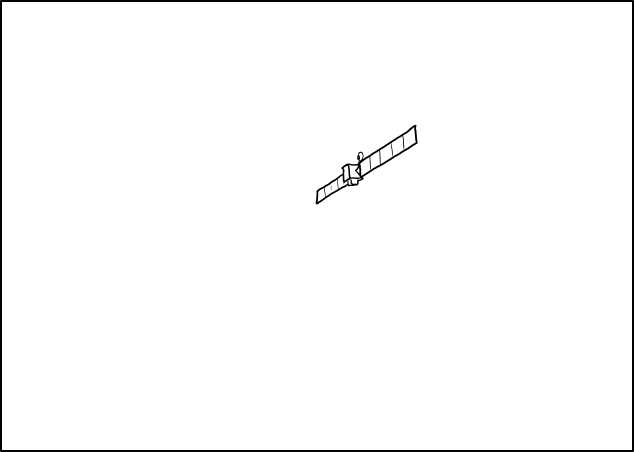 However, eight pictures were not included in the original table with the Frame by Frame Breakdown below. 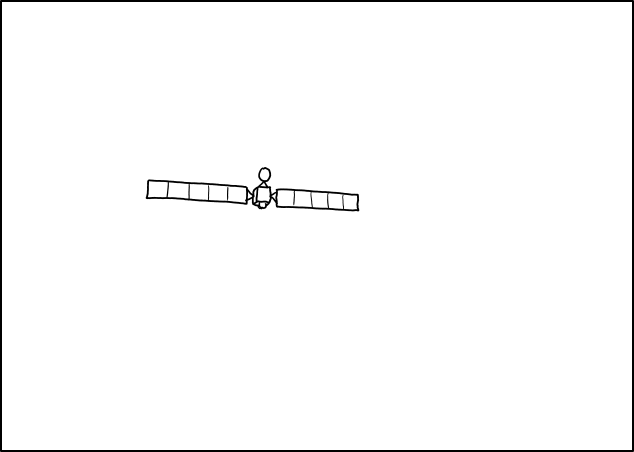 So it must have been some of those missing pictures that were added later - maybe all of them, as the last three may already have been added before the last picture was released (All 143 pictures are included in the flip-book gif image shown here above). 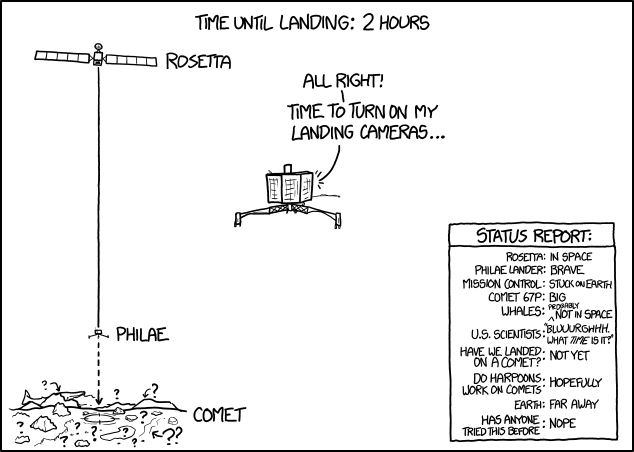 But even 143 pictures at 5 minutes intervals only spans 11 hours and 50 minutes, thus there are still five 5 minute intervals without any picture. 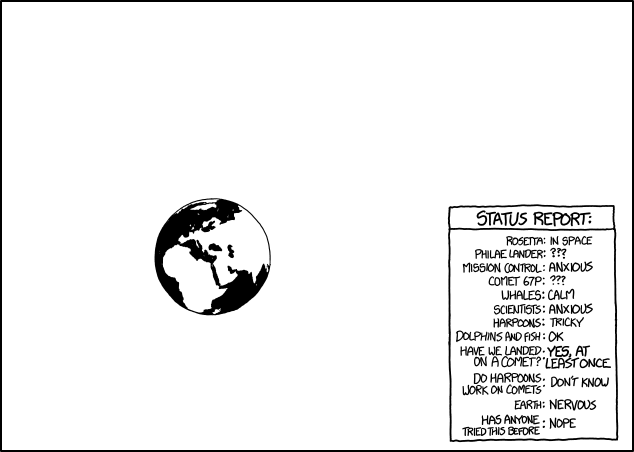 See which in the table. 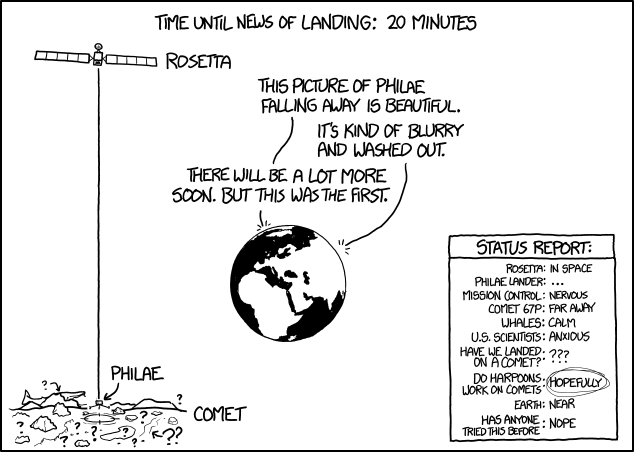 The Rosetta space probe is shown in 1621: Fixion, which explains the Flyby anomaly experienced the first time (of three) the probe got close to Earth. 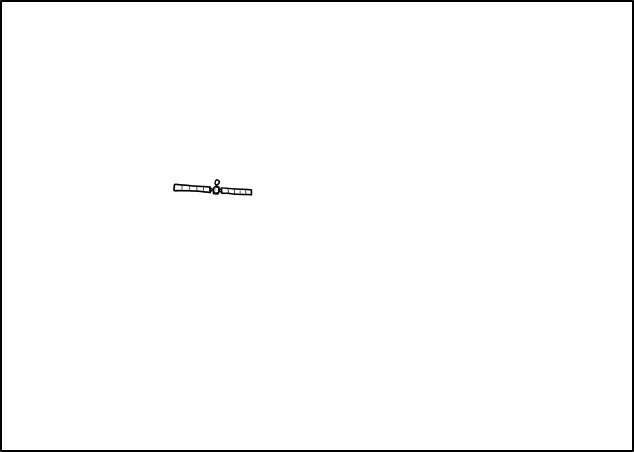 Here is a link to a table with a frame by frame breakdown of all 143 pictures.  Here is a page with all the pictures frame by frame. Have we landed on a comet? 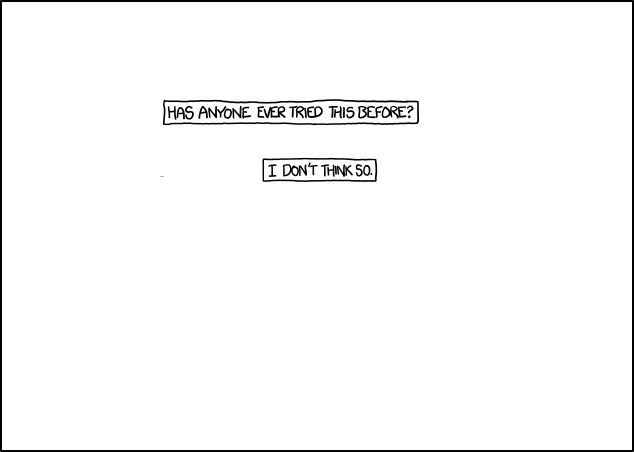 : YES. 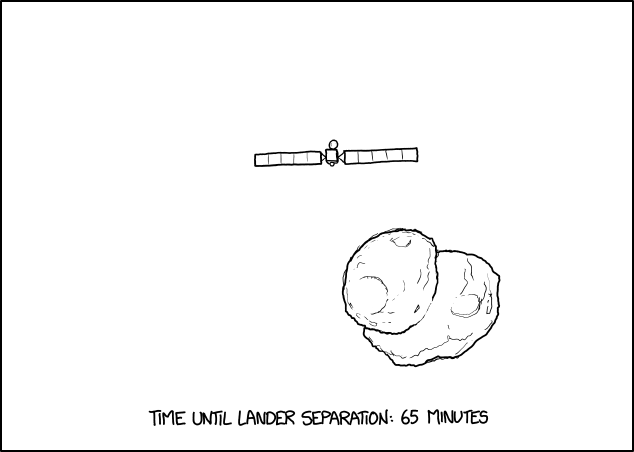 There appears to be a brief error between 02:35 and 02:45, where the time until lander separation is shown as 1 hour, counting down to 50 minutes, before being corrected to 75 minutes at 02:50. Since this was supposed to be during the "non-live" section before Randall got up (and got live) it is not sure whether this was a "real" mistake, or if he was up anyway, and corrected this timing error when he discovered the plans had change during the approach flight. 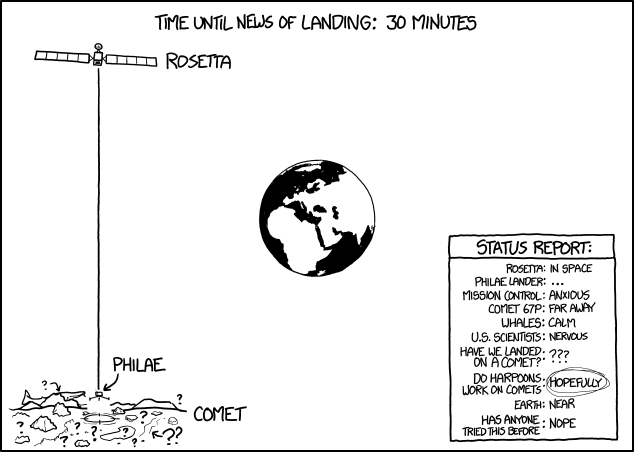 Later after the initial release of this comic Randall added a link to this page. 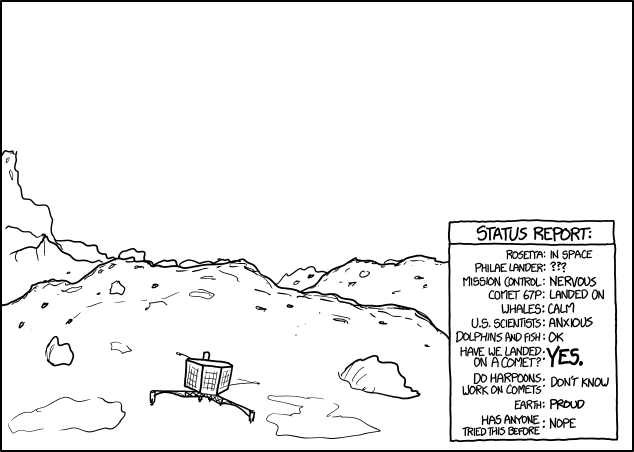 It's the first time this wiki is mentioned at xkcd itself and it's viewable in the HTML-source or here: https://xkcd.com/1446/info.0.json. 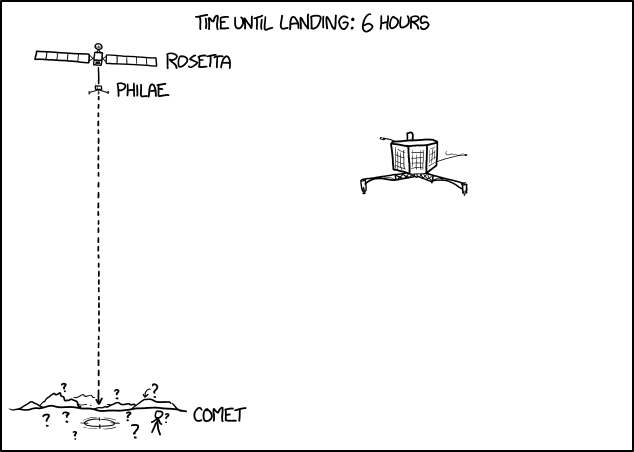 The text is: "A very thorough explanation of the comic is available here: http:\n\nwww.explainxkcd.com\nwiki\nindex.php\n1446:_Landing". 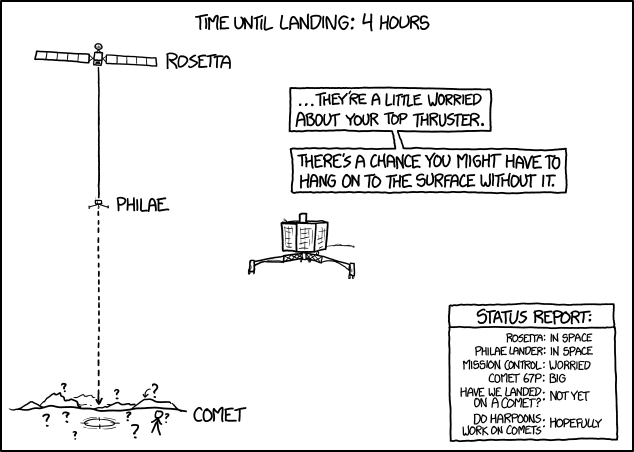 Almost definitely. 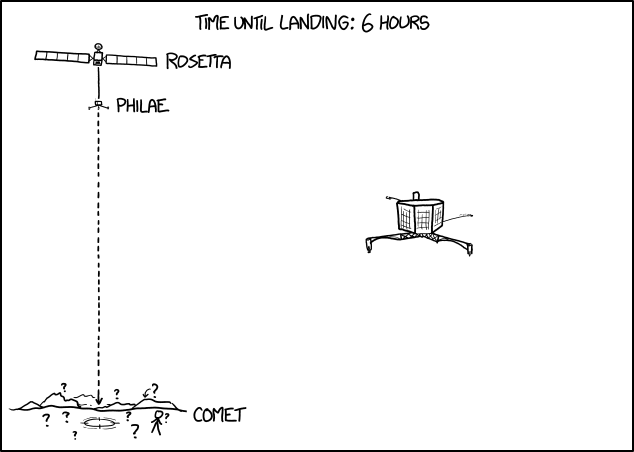 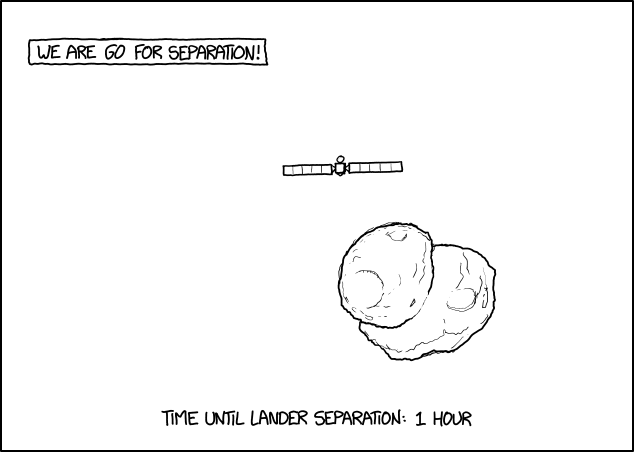 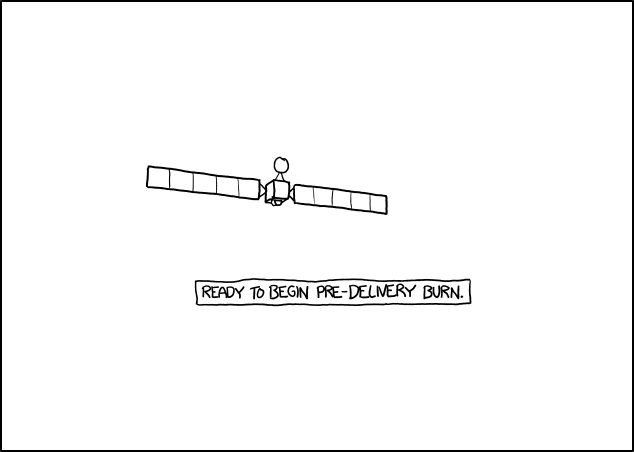 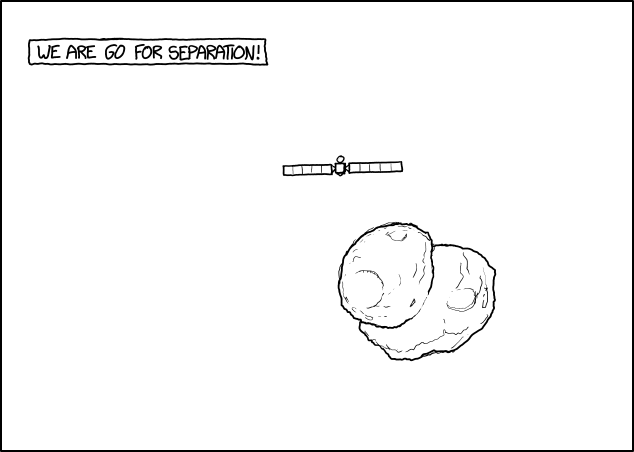 The URL for the image (http://imgs.xkcd.com/comics/landing/r_00-40-00_wmf0bPtxDN.png) contains 'landing'. 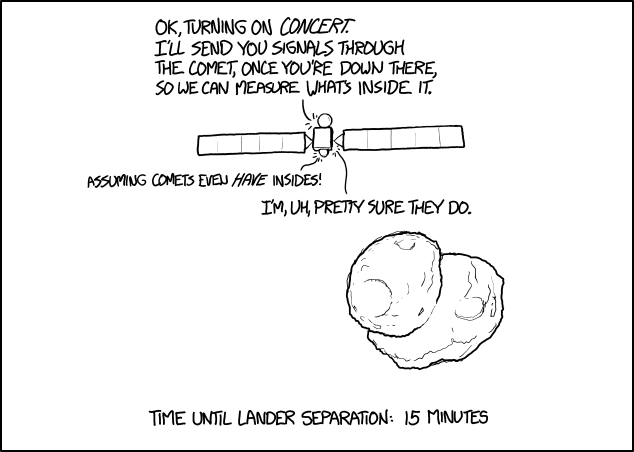 Randall switched to SSL after 1:30 but you can of course use either server. These were not logged here at the wiki. 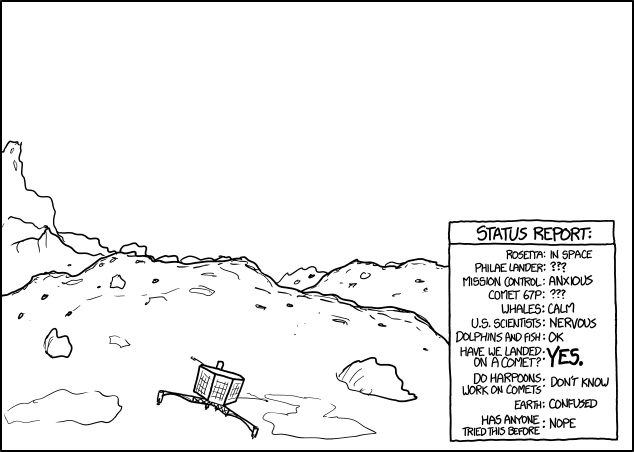 Check the xkcd forum for release details. 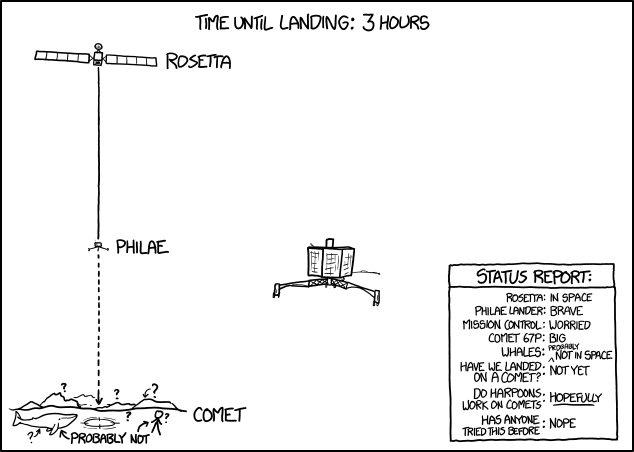 This page was last edited on 19 August 2018, at 16:32.